I was chatting with my friend Paul yesterday and he, to my comfort, confessed that he had the same attitude to exercise and training as I do -- if he isn't working towards a race, he can't get himself to run. I not only have to have big goals, but really like to combine milestones within the training for those events with other races or events. We had done a mile swim in the lake that morning (maybe Shaun did a mile and a half? 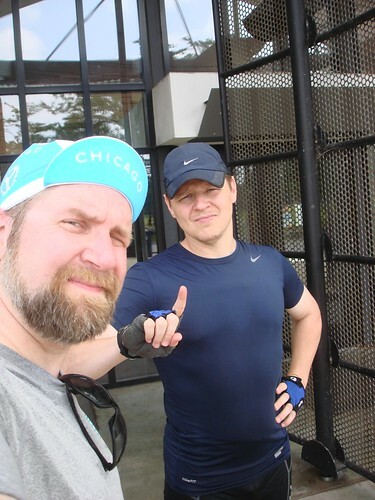 He's now mentally checked in to doing an Ironman next year, so he's treating the Olympic-length triathlon we're doing as now a stepping stone along the way to his larger goal. Me, I'm treating it as a major accomplishment.) and so it was a really good triathlon "brick" day. Shaun and I both bought wetsuits this weekend, which means that we're no longer contrained by the Saturday morning, Tuesday evening schedule of Fleet Feet's wetsuit rental at Ohio Street Beach. It also means that now I have to go swimming in the lake all the time to justify having bought a wetsuit. Yay? People keep asking, so I'll reiterate: Chicago Triathlon, Sunday, August 30. * And it's actually 1.8 miles from my house to Margate Park, so it's almost 40 miles all told. YAY, Fuzzy (and Shaun)!!!! I'm wishing you luck and endurance for your triathlon(s)! I also have a friend that did really awesome when she had a goal--like the mini triathlon at her Y. She said it had to be something to keep her going so she didn't find all these crazy little reasons NOT to do it. Great job! well that's just a great photo.